This story is about four men who work in a confectionary. 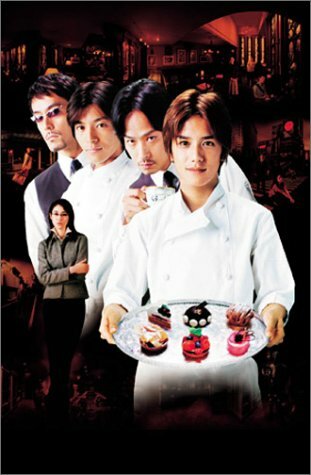 Tachibana Keiichiro (Shiina Kippei) is the owner; Ono Yusuke (Fujiki Naohito) is the superb baker that has a mysterious and mesmerizing aura; Kobayakawa Chikage (Abe Hiroshi) is the waiter and close bodyguard of Tachibana; and last but not least is Kanda Eiji (Takizawa Hideaki), the ex-boxer who loves cake so much that he becomes a waiter at ‘Antique’. This is a refreshing, yet heartfelt comedy about the 4 very unique personalities that work until the wee hours of the night at the small confectionary. The series follows the romance, family life, and most importantly friendship that these 4 men from different generations experience.This is a confectionary with a “flavor” not like most. Located in the middle of an ordinary residential area, “Antique” stays open until 2 a.m. Every single thing in the shop is antique, in fact even the sherry glasses that water comes in look like they would cost 50,000 yen. On top of this, all the sweets that are sold are unbelievably delicious. The thing that is most peculiar about “Antique” though is that all 4 of the men that work here are very handsome, and each has an interesting past. Those that frequent the store also have a story to tell.